Watering cans are an essential gardening tool that can vary in size, shape, and capacity. You'll want to choose one that is well balanced and easy for you to handle. You'll also want to be sure that the one you choose is made durable so that it will last you for many gardening seasons. There are many attractive models available that fit the criteria of both beauty and function. Remember that liquid can be quite heavy. You may want to fill your container only half-full and make two trips. Or, you may want to buy two watering cans. You can fill each container half full and still be able to carry the same amount of water. Two half full containers is also a good way to distribute the heavy weight of the water more evenly onto both sides of your body. Be sure to purchase a model that has a removable sprayer. This will make it easier for you to clean out any residue that may get caught in the sprayer area. 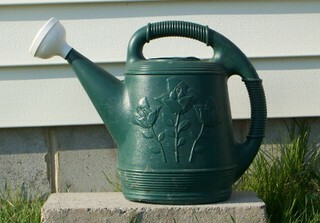 Generally watering cans are available in metal or plastic. Whether to buy and use a metal or plastic container is a personal preference. There are some beautiful metal containers available. The metal types tend to be both heavier and somewhat more expensive. Plastic containers may be less expensive. Remember that plastic is also available in different thicknesses. Be sure to purchase a thicker type of plastic to get many good seasons of use out of this essential gardening tool. Also, be sure to keep your plastic container out of direct sunlight. Direct sunlight may very well weaken or melt a plastic item ... even if it is a thicker plastic model.